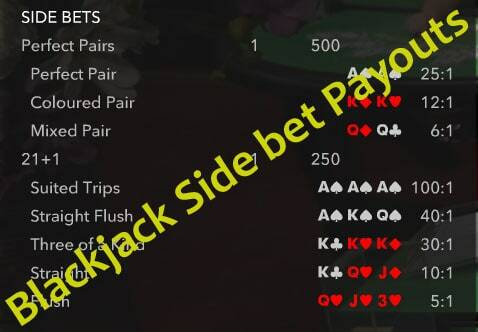 The Truth about Blackjack Side Bet Payouts - Be Warned! 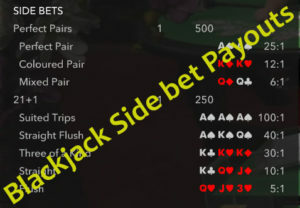 I’ve just started playing Blackjack side bets. I’ve always avoided them in the past, primarily because I know that the RTP on them are not very good and I always want the best value for my bets. However recently I’ve been experimenting with a few rounds on Perfect Pairs and the 21+3 side bets. Amazingly I’ve hit some pretty big hands and at the moment I’m probably ahead with my bets because of them. 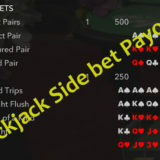 I think I’ve always known that there were some difference with the payouts of some of these side bets between the different software providers. But I didn’t realise the impact this was having on my bankroll. So I’ve done a bit a of trawl around to see what the differences actually are. If you play side bets you should take note. You may be loosing when you’re winning by playing side bets at the wrong casinos. As you can see from the payout table, Evolution Casinos have the best returns on payouts. Extreme Live Gaming also have the same payouts but finding casinos that offer the side bets in the first place is more challenging. The casinos from Visionary iGaming fair the worst for payouts, but they have one of the best Blackjack games around. They are worth playing for the Early Surrender option.